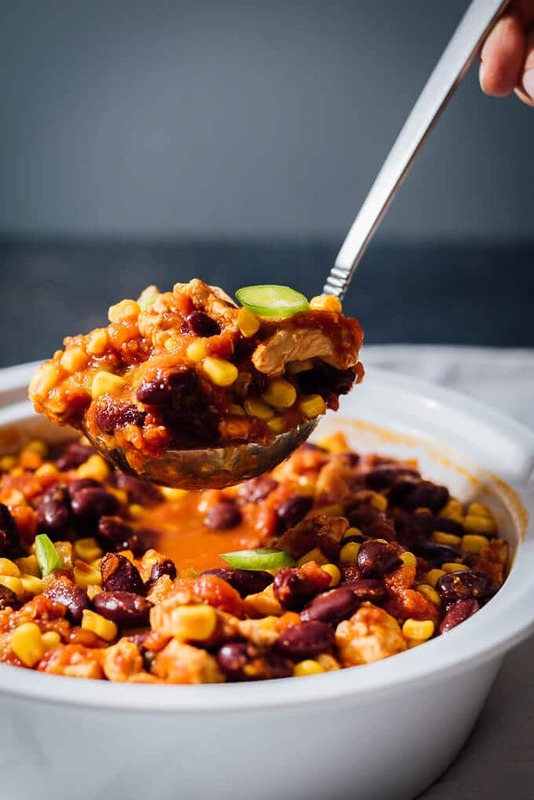 Quick and Easy Chicken Chili is one of the hearty quick meals that every busy mom needs. You don’t need to worry about the weeknight dinners anymore if you have the ingredients for this chili. 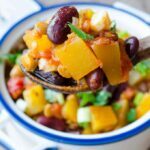 Easy, quick and so hearty! 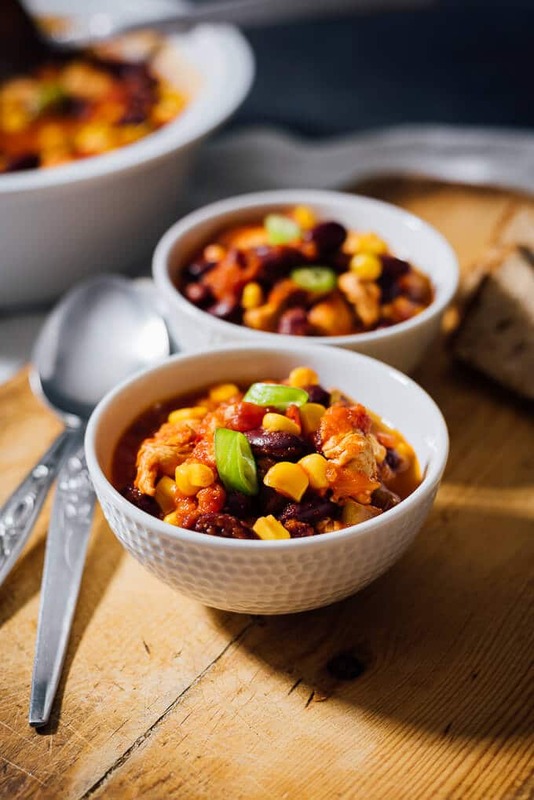 If it has started to get freezing where you live, try this easy chicken chili recipe and get all the compliments from your family. Who wouldn’t be pleased with a hot and hearty meal like this when it’s raining or snowing outside? It’s almost the only thing we dream about when we are on the way home on a chilly weekday. Ok I have some good news for you! 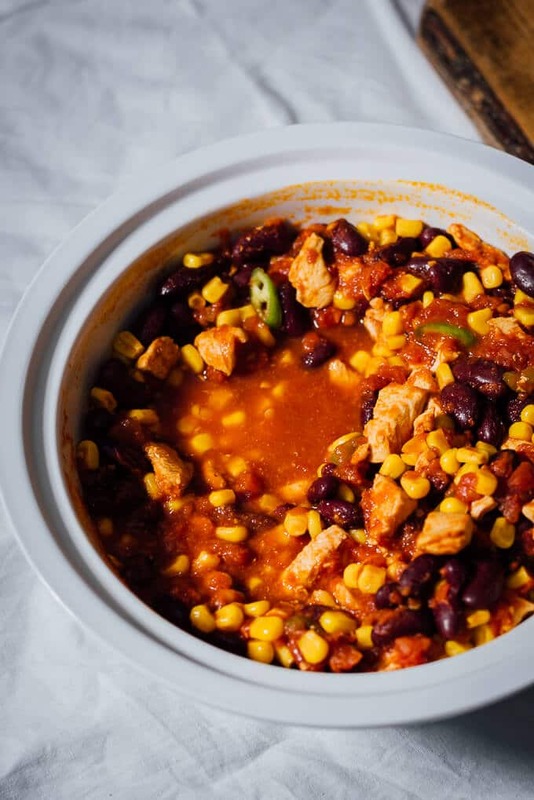 I have a very easy recipe for chicken chili that you can put on the table in 30 minutes. 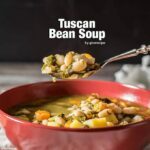 You will be amazed with the result and decide to keep the recipe on hand for times when you need a quick family dinner. 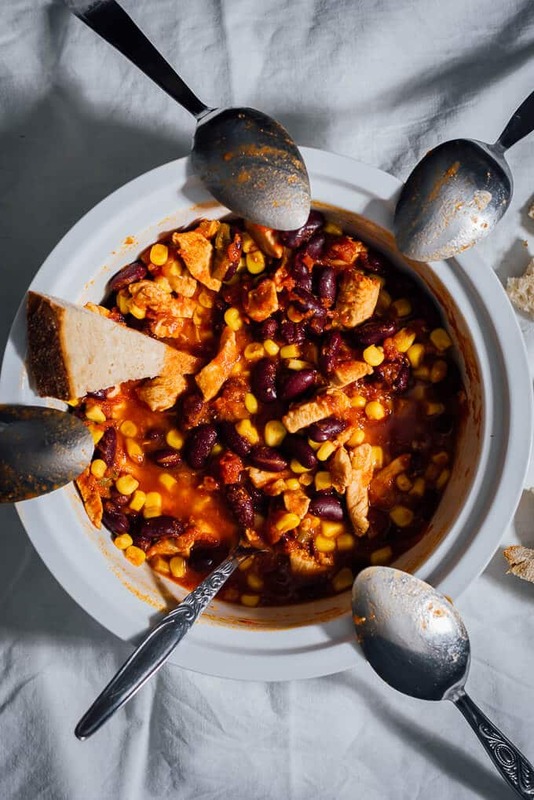 Quick and Easy Chicken Chili is one of the traditional winter recipes that everyone should know. 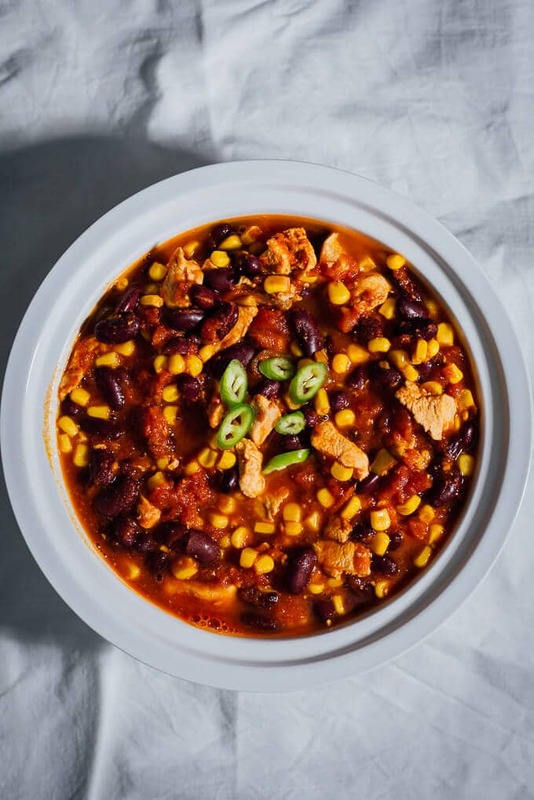 Shredded chicken, kidney beans and corn are cooked in a hearty tomato sauce. Such a comforting one pot meal is perfect for this time of year. You will even have leftovers for the next day, which means one pot meal recipe for two meals. 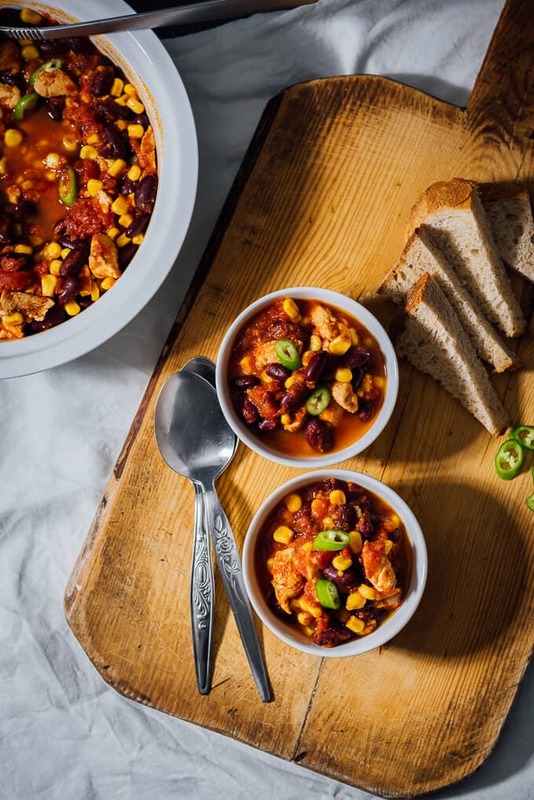 If you are one of those who don’t like winter like me, this quick and easy chicken chili will help you tolerate the weather. 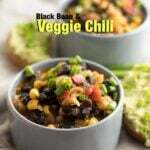 You will get really warmed with this hot chili and will easily ignore the cold outside. This meal is absolutely a crowd pleaser and one of the rare meals that kids eat heartily. You can serve the chili with a extra chili pepper slices on the top. This is so good that sometimes your family members can’t wait to have it in separate bowls and just eat it right from the pot. Disclaimer: This post is sponsored by alli®. All thoughts and opinions are my own. 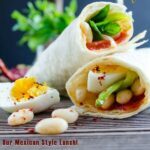 Find more alli® weight loss recipes at alli. You don’t need to worry about the weeknight dinners anymore if you have the ingredients for this chili. Heat a medium saucepan over medium-high heat and spray with cooking spray. Saute chicken pieces for 3 minutes or until white. Stir in chili powder and cumin to coat chicken. Saute for 3-4 minutes. Add the rest of the ingredients and heat thoroughly. Let it simmer for 25 minutes. Serve with chopped green chili pepper on the top. Note: Nutrition facts are estimates only. 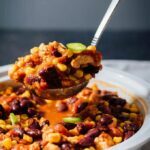 Can i try this recipe without adding chili? how it will be tested? This looks incredible! Wow I so am going to make this. Cheers to an awesome recipe! Thank you Jay! Would love to hear what you think when you make it. I’m always up for a new chile recipe and with chicken, I’m in! Hi Kevin, this chili is perfect in this season. Soo comforting! Hope you have a chance to try it. Thank you Camilla! Hope they love it as much as we do. There are few things in this world that bring me as much joy as chili season. LOVE this recipe and that it’s so low maintenance… can’t wait to try it out! Hi Karly, that’s the exact same reason why I love fall. This is one of the easiest weeknight dinners. Hope you love it as much as we do when you try. Looks so appetizing! I love chili, but have never tried making it with chicken. You’ve inspired me. Thank you Victor! This is a perfect match for the season! And chicken is great in chili. You need to try it!